Sterling silver handcut McKenna headjoint, sterling silver body and footjoint, silver plated keys, French (open hole), pointed key arms, drawn tone holes, .016" tubing, Pisoni pads, B footjoint . The NB-700 has all of the great features found on the NB-600, with the addition of pointed arms. 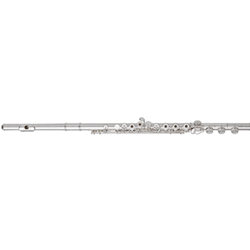 Pointed arms allow for a lighter touch and keep your flute in better adjustment than Y-arms.